Austin, TX – April 3, 2014 – One of the most notable names in motorcycle racing, 1993 World Champion Kevin Schwantz will once again be wearing RS Taichi leather suits and protective gear. Schwantz wore RS Taichi gear during several of his memorable seasons in the 500cc class, including time spent in Pepsi and Lucky Strike livery. His partnership and success with Taichi apparel all started with his victory at the 1988 Daytona 200. Schwantz took to the track in RS Taichi leathers again for the first time on Monday at the Circuit of The Americas media day, as newly appointed motorcycle ambassador for the circuit. It has been announced that later this year, Schwantz will pair with his original 1986 Suzuka 8 Hours teammate, Satoshi Tsujimoto, to contest the prestigious race on a special Yoshimura Suzuki "Legends Team". The Texan has also been known to pop up at the occasional club race, and instructs at his Schwantz School. 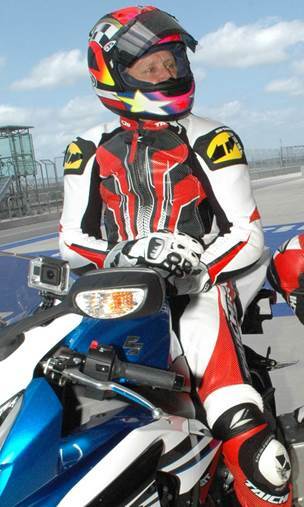 So even at age 50, Schwantz genuinely puts his protective gear through its paces. Kevin Schwantz commented, "I am really excited to be riding the Suzuka 8Hour again in 2014 with my 1986 teammate Satoshi Tsujimoto on a Yoshimura prepared Suzuki. To wear RS Taichi leathers, whose leathers I wore from 1988-1992, for the 8Hour race this year will be great as their hands-on attention, service and support, in Japan is what you have to have for an event like the 8Hour race!" Audrey Menarik, owner of Moto Liberty, the U.S. importer for RS Taichi commented, "I've worked hard for the past 6 years to bring RS Taichi back to the level of brand recognition they deserve. When I heard Kevin was returning to Taichi, I was elated. There could not be a better ambassador for the American market than Kevin Schwantz.". In addition to a very long history of involvement with motorcycle racing in the U.S., Moto Liberty also serves as one of the largest motorcycle gear retail stores in the region, and services the growing RS Taichi U.S. dealer network. RS Taichi has been producing high quality riding apparel for over 30 years. Founded by former professional motocross racer Taichi Yoshimura, the company is based in Osaka Japan. RS Taichi offers a complete line of street and track related products, from basic, everyday riding necessities to the very pinnacle of professional level racing equipment. For the 2014 season, they are the racing leathers provider of choice for such notable American racers as three time AMA Superbike Champion Josh Hayes, Dane Westby, Chris Ulrich, Jake Holden, Michael Barnes, and many others in the world and national championship ranks. Kevin Schwantz To Race Suzuka 8-Hour! Welcome at Laguna Seca anytime!